This weekend (15th -16th September) it’s Glasgow Doors Open days, an opportunity to get inside some of Glasgow’s fantastic buildings. 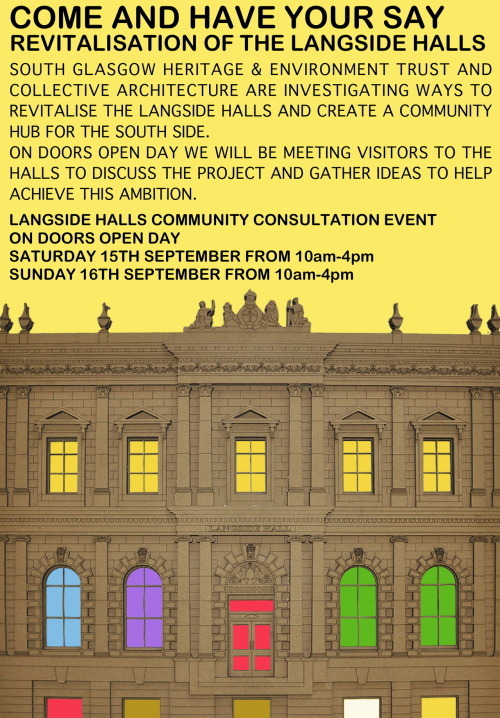 A building we’re particularly passionate about at the moment is Langside Halls, near Queen’s Park in the South Side of the city. The A listed former bank was re-erected in 1901, and now functions as a resource for the local community. Collective Architecture have been asked to develop options for the long term use of the building, identifying ways of adapting spaces to better suit users needs and help establish the halls as a community hub. As part of a series of workshops engaging with the local community and existing building users, we’ll be running workshops in the building this weekend to discuss ideas for revitalisation of the building. There will also be historical drama performances from TRAM Direct Theatre Company. If you’re in the area, do come along and say hello!